The horses plodded slowly down into the dip and just stopped. They lowered their heads and started munching the thick green grass, so different from the dried grasses of the open prairie. Two arms appeared, then an entire body wiggled out from under the canvas wall. The body wore short pants and a Norfolk jacket. It was a little boy. Dorothy breathed deeply to calm her racing pulse. His face looked so much like Rose that he could have been her twin. The tent flap opened and a young woman stepped out. Pushing stray hair off her hair, she smiled wanly. “I’m glad to have company,” she said. The colour drained from the woman’s face. “Scarlet fever,” she repeated. Putting both hands over her face she stammered, “Excuse me,” and disappeared back into the tent. Finally Dorothy crawled forward and clutched the seat. Craning her neck, she peered around the curving canvas wall. The wagon perched at the very edge of an abyss. Dorothy sucked in a mighty breath and huffed it out. Now she felt calmer. She gazed at the far cliff, where she had stood yesterday. Several wagons gathered there like round white insects. Suddenly her wagon levelled off and they were on the flat prairie again. “By golly, we did it!” Dorothy cheered so loudly, she was sure the colonists on the far side looked over and waved. “By grit and by golly,” said Dad, thumping Frank and Patrick on the back. Soon the wagon stopped. Lydia climbed down, sighing wearily. Suddenly there was a piercing shriek and Lydia scrambled up again. “Go, go, go!” she screamed. Jumping up beside her, Dad flicked the reins over the tired horses. “Whatever happened?” gasped Dorothy. No one answered. Lydia nodded, gazing numbly ahead. For several minutes she sat in a trance. “Why did the horse die, Dad?” asked Dorothy, trying to imagine the poor animal lying flat on the ground. Coteau Books, Amazon, Chapters or your favourite independent bookstore. 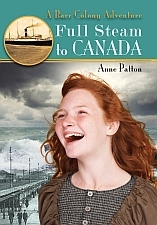 Award-winning author Anne Patton has written many books for children. She lives in Victoria, B.C. with her husband, and spends her time gardening, looking after her grandchildren, travelling and working on a new historical adventure. 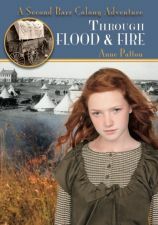 You can learn more about Anne and her books at the Children’s Writers’ Round Robin, The Saskatchewan Writers’ Guild, and Coteau Books. Anne loves to do readings about Dorothy and the characters in her other books. If you live in Saskatchewan, you can book her through the Saskatchewan Writers Guild Author Reading Program. 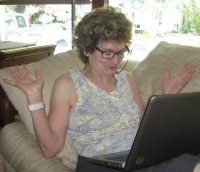 Otherwise, you can message Anne through her Facebook Author Page (link below).